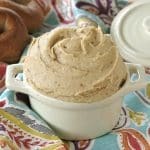 This INCREDIBLE Healthy Cream Cheese Frosting doesn’t use powdered sugar, a sugar substitute or even butter. Yet, it’s sweet, creamy and perfect for carrot cake, cinnamon rolls and so many other sweet treats! I’m over the moon excited to share this recipe for cream cheese frosting sweetened with Medjool date paste. It can be enjoyed on a clean eating diet and is easy to make. Using the right type of cream cheese it’s vegan too. Most importantly, it’s absolutely divine! Even though it’s healthy, it doesn’t taste healthy, which is why it’s such a hit at my house. 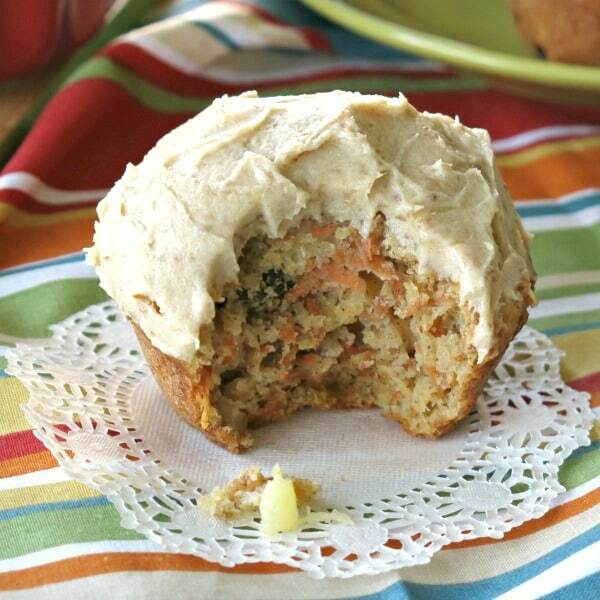 I developed it for our Healthy Carrot Cake Muffin recipe…because you can’t have a good-for-you muffin topped with sugar-laden icing. Cream cheese – any variety will work including low-fat and vegan. Note: Cream cheese is easier to work with at room temperature. Remove it from the wrapper, cut it into cubes and allow it to sit at room temperature for about 15 minutes. Another option is to microwave the cubes for about 10 seconds. 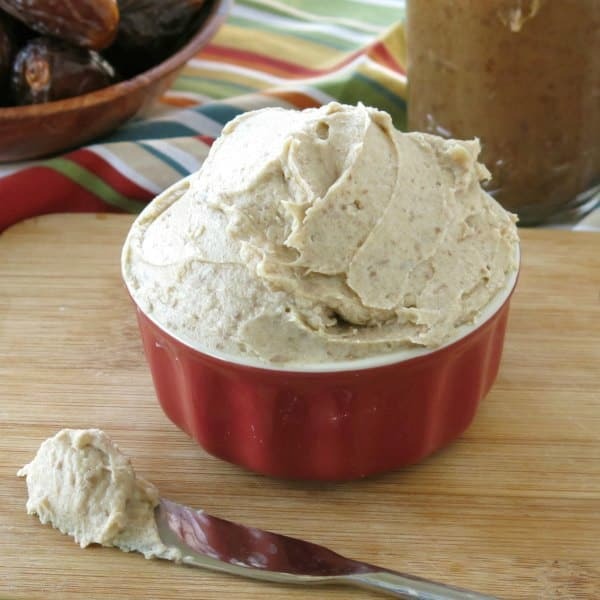 Date paste – can be purchased online or in specialty stores, but it’s so easy to make! Soften and then puree Medjool dates in a food processor until they reach a creamy consistency. 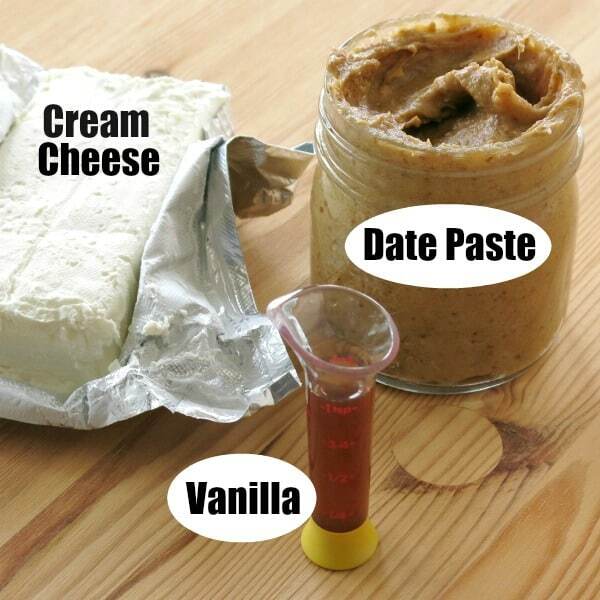 Check out our full tutorial on How to Make Date Paste. Note: for best results, allow the date paste to come to room temperature along with the cream cheese. 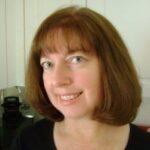 Vanilla extract – can be left of out of the recipe but adds a little magic. Other extract flavors such as orange or almond would be amazing too. Additionally, milk of any type (including skim, rice or almond milk) may be added to thin the frosting if desired. However, I find that just whipping the ingredients a little bit longer usually lightens it up perfectly. To make the frosting, thoroughly combine the ingredients with a hand mixer. Beat the mixture for several minutes for a light, fluffy frosting. That’s it! If necessary, add milk in teaspoon increments to make the frosting thinner. Note: The frosting color is a light creamy brown with tiny specs of dates. It tends to lighten in color the longer it is mixed and may darken a little in the refrigerator as the dates settle. The recipe yields 2 cups of frosting. If you’re making a 2 layer cake, double the recipe. Otherwise, this amount should cover 2 dozen cupcakes, muffins or cinnamon rolls. Store cheese frosting in the refrigerator in an airtight contain3er. Lift it out of the refrigerator about an hour before you want to use it and allow it to come to room temperature before frosting a cake. You may even want to fluff it up with a hand mixer again. Muffin topping, especially Healthy Carrot Cake Muffins! Cheesecake Stuffed Strawberries – follow this process but fill each strawberry with the cream cheese frosting. 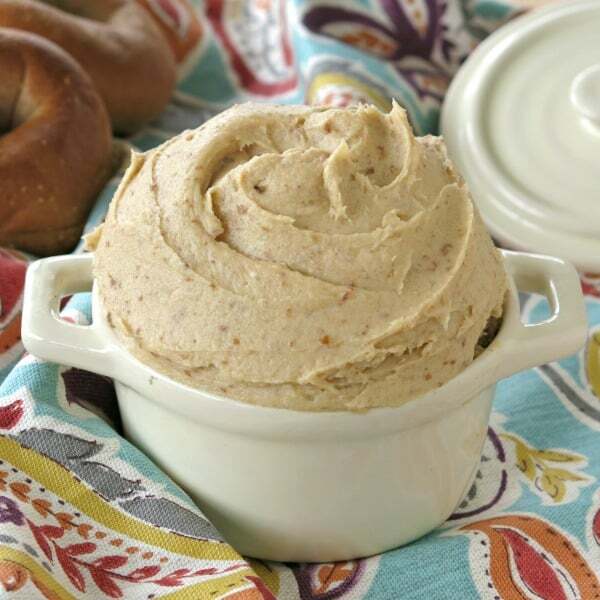 Healthy Cream Cheese Frosting is sweetened with date paste instead of sugar. It tastes INCREDIBLE so it's hard to believe it has just 3 clean ingredients! Add all of the ingredients to a large bowl and mix for 3-5 minutes or until smooth, creamy and fluffy. If necessary, add milk in teaspoon increments to achieve a thinner consistency. 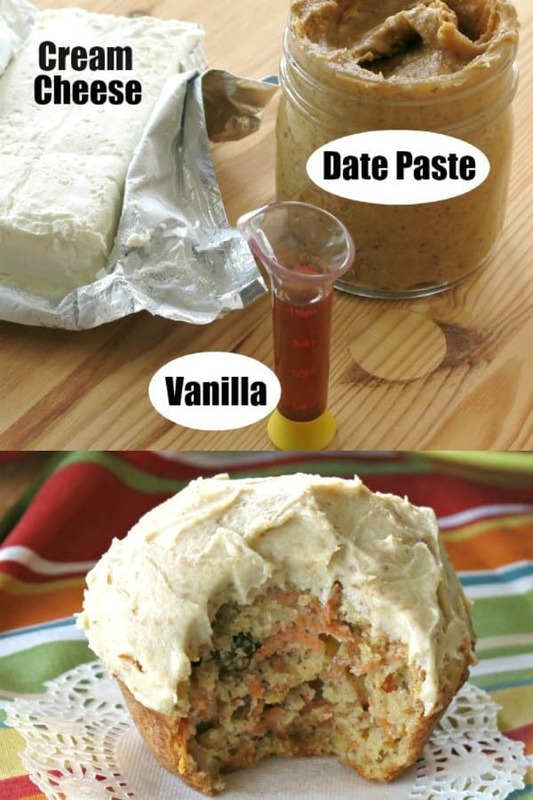 Additional date paste can be added for a sweeter frosting. I really like cream cheese frosting. So glad to find a healthier option! Oh my gosh this was a wonderful treat! I spread it on some homemade bagels! I was thinking to make date paste when I ran into this recipe. I’m excited to finally be able to frost my cake! I can’t eat much sweets but I have a sweet tooth. Thanks for this recipe! Love to know how it turns out. Enjoy!! !